"Centrifuge," acrylic on canvas, 24 x 30, 2018. Centrifuge was created in a sound bowl session and the painting turned out so different from the rest from these sessions. I was feeling distracted and discombobulated, which others in the session were relating to. When the others in the group heard my description of what I was experiencing and feeling in the time-frame they said they saw their experience in the artwork. The collective unconscious experience we all go share in these sessions is a connected, beautiful thing. 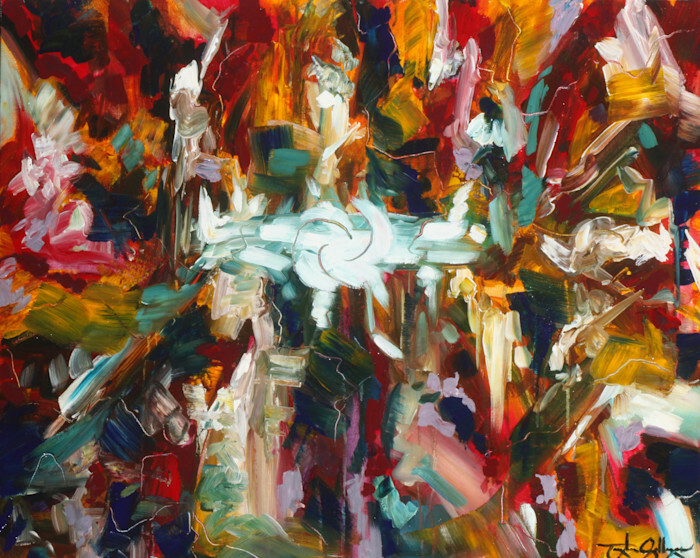 Abstract "Centrifuge" painting as fine art reproduction or original artwork by Southern California Artist, Taylor Gallegos.